Does Jessica Haunt Pike Lodge? 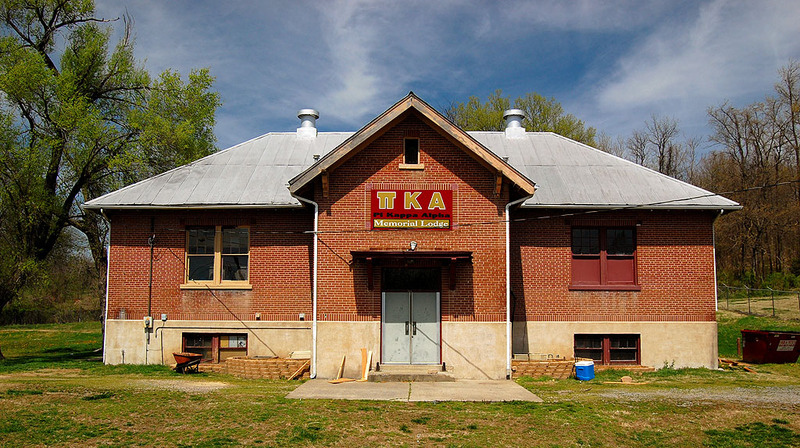 I’ve driven past the Pi Kappa Alpha Memorial Lodge many times, but I never knew much about it. I’ve always thought I’d like to the have the aluminum beer can recycling concession at the place, but that reflects my prejudices. The parking lot was empty on Easter Sunday, so it seemed a good time to pull over for a quick mug shot of the building. I had heard that the building on South Sprigg, just below the cement plant, had been a former school, so I didn’t think it would take long to get its history. Pickings were slim, though. The Pike web site had this to say about it: November of 1973: Pi Kappa Alpha had long been searching for an off-campus building for many functions. In the Fall of ’73 the chapter and its housing corporation found the Lafayette School house on S. Sprigg St. The Pi Kappa Alpha Memorial Lodge, as it would come to be known, serves as a social place as well as a post for weekly chapter meetings. What was more interesting was a 2007 visit to the lodge by the Paranormal Task Force conducting a two-day Ghost Hunting 101 Class with the Adult Education Department of Southeast Missouri State University. You can get the whole story by following the link above, but here are some highlights. The SEMO Pi Kappa Alpha (PIKE) Lodge is rumored to be haunted by the spirit of a girl ghost named Jessica who in the early 1900’s met ill fate when this was once the Lafayette Schoolhouse. The stories vary a bit, but the common denominator in all of them involved the old boiler, coal chute and the grate above them. Eye witness accounts and various online legends report that neighbors have seen the spirit of a little girl through the windows playing jump rope inside or just standing at the front windows watching when a train passes on the nearby tracks. Another story tells of a young neighbor boy who came over when the Lodge was having a meeting asking if it was okay for him to be in there when they were all gone. When the brothers of the Lodge told him no and that was dangerous, the boy told them he came over many times in the past to play with the little girl there. Other accounts include strange noises, the lights swaying excessively on their own, open windows slamming shut or shaking, strange rappings, the unexplainable malfunctioning of electrical equipment and sinister laughing manifesting where the boilers once were. What did the PTF team find? Unexplainable EMF spikes which moved about and reached levels near 10 milligauss. While using two K-2 EMF meters and having two different people hold one each at a good distance apart, we were able to document interaction with an entity there through “yes” and “no” questions with one meter/person being “yes” and the other “no”. This interaction indicated that the entity we were in contact with was male, enjoyed us there and became lonely at times. There was further possible indication through this EMF process and sensitive investigators present that this may have been the spirit of a PIKE Brother who possibly passed away unexpectedly due to a tragic event or happening. I may have missed Jessica when I looked away from the lodge toward the cement plant. All I saw was Spring starting to make the Winter blahs go away. Several folks have written to question my info that the Pike Memorial Lodge was the former Lafayette School. They think its the old Marquette School. That thought crossed my mind, too, but I assumed that the Pi Kappa Alpha frat boys would know what they had bought. A reliable source sent me two links to Missourian stories about the dedication of the school in 1924 and the dissolving of the Marquette School District in 1968. I’m going to go with the consensus that the Pike Memorial Lodge IS the old Marquette School and the Pike who wrote the history of the place was NOT one who spent too much time on academics. November of 1973: Pi Kappa Alpha had long been searching for an off-campus building for many functions. In the Fall of ’73 the chapter and its housing corporation found the Lafayette School house on S. Sprigg St. The Pi Kappa Alpha Memorial Lodge, as it would come to be known, serves as a social place as well as a post for weekly chapter meetings. Now I can see how a good ole Pike boy could get Lafayette and Marquette confused, especially after a kegger!! If I was going to make up a name, I’d have gone with something easier to type like Fox School. I always envied kids with short names from places like Arab or Oran. 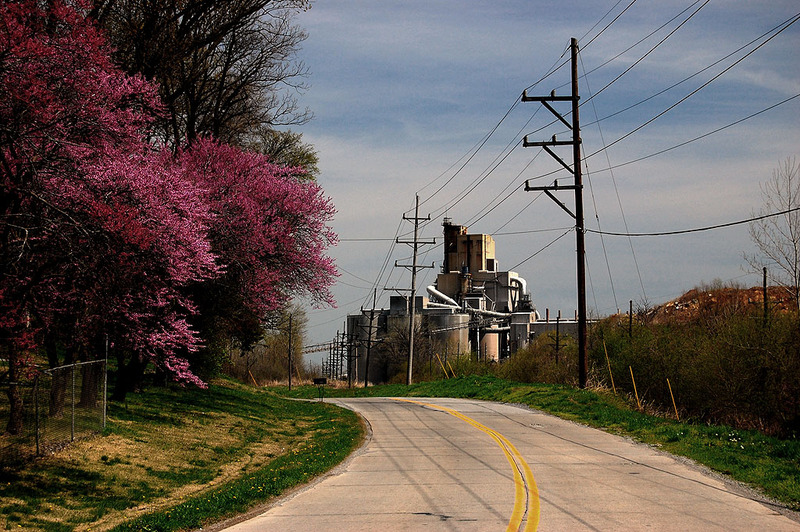 When you are born Kenneth Lee Steinhoff of Cape Girardeau, Missouri, and live not far from Cape LaCroix Creek, which runs into the Mississippi River, you learn that writer’s cramp is a lifelong affliction. I am a graduate of the Marquette School, 1947. After moving from our Southwest Gordonville farm in 1942 I began attending there. There were two rooms, grades 1-4 and 5-8. The teachers I can remember were Laura Snider and Mr. McCullough. There was a small, red bus that picked up the graduated students in the district and took them to the College High School on SEMO Canpus. On the return trip the students from the Highway 61 (I lived where the Heuer Sons Implement dealership is now located), up the Benton Hill Road (now Silver Springs), down highway 74 to the Bloomfield Road location, then down the old Highway 61 Highway to the vicinity now Rhodes Travel Center is located, then back to school picking up students along Sprigg Street to the school. Since my memories of Marquette School are from the 1940’s, the war years, I remember our classes going as a group, to across the RR tracks, into the fields and fencerows to collect milk weed pods which the goverment then used for filling life preservers etc. No one else I have talked to remembers this, however I SURE DO. If you go around to the back you can see the extension that was the library. When I was there we had no cafeteria and the heat was by a huge coal furnace (which the boys helped keep going), outdoor restrooms (way back against the fence), and the basement floor was dirt. I later learned that the heat was upgraded, the basement became the cafeteria etc. All for now, I have to go mow on the beautiful day. BTW Ken, is there any way to upload or send you any pictures that might be of interest. Probably why most on you e-mail list would not be as familiar with Marquette School is that the district paid only to send students to College High…not CHS. That’s great info. I’ll have to root around to find some stuff from College High. I know I covered some events there. Ditto Notre Dame. Just not enough hours in the day. Sure, send stuff to ken@steinhoff.net. Just make sure that it’s OK to reprint it. I hate it when someone rips off my stuff without asking, so I don’t want to do it with someone else’s pictures. I definitely remember when affomentioned school was operating in the late 1930’s. A good buddy of mine, charlie Ross attended there I think. My son and I drive by that house every morning on the way to school in hopes of seeing something off. Much to our disappointment, we haven’t seen anything unusual yet. If nothing else, the stories of the haunting keep us entertained on that morning drive! My great-grandmother worked in the cafeteria at the Marquette School. When they closed, she got one of the teacher’s desks and now I have it. It is such a neat old desk. I get alot of compliments on it! This is interesting we are paired with pike for homecoming and have been doing pomping out there this week. It’s definitely a creepy place inside and I’ve heard strange noises from the basement windows when I’ve been outside. The pikes are good guys though and you can’t believe everything you hear. I know from personal experience that they are a respectable group of men and they take pride in their fraternity. This is Marquette School. My father went to school there in the 1930’s. I started 1st grade there in 1962 and was in the 7th grade when the school was closed at the Christmas break in 1967. I went to Marquette School back 1963-closure 1967. Was a two room school house with Cafeteria in the basement. Use to hold dances and Christmas patries down there. Although was a small school I really enjoyed it there. Still have some nerdy school pictures somewhere. As far as the school being haunted,the only scary thing I can remember about the place was my grades, ha. Hi, I am Mike Brown and I am doing some research to see if the “Jessica death” is factual, and it looks like you were doing some research on this too. I am just curious if you have found evidence of a girl named Jessica that actually died at the Pike Lodge? I attended Marquette school grades four thru eight from 1960 to 64. Then went to college high . Loved it. I attended 2nd and 3rd grades there in 62 and 63 – grades 1-4 in one room and 5-8 in the other. I remember the bathrooms out back and that crazy skeleton of a merry go round in the front. The basement cafeteria put out some fairly delicious food as school fare goes! I can remember my mother and my aunt talking about collecting milkweed pods for the same reason during the War. They went to Juden School, so this must have been a widespread project. Also, my dad went to Marquette School for a time. I asked him once about a ghost, and he had never heard of this when he attended the school. Finally, I never remember hearing about any school in Cape Girardeau Co. named Lafayette School.